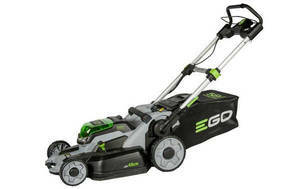 Snapshot: The EGO LM2001E is a mulch & catch battery-electric mower that weighs 23.8kg and has a cutting width of 49cm. But is it a smooth operator? Easy to push and manoeuvre. Very good battery life (45 minutes). Wide cut width for a battery mower (49cm). 07 Dec 2018, Michael S.
"Good mower -but could be improved"
26 Nov 2018, Rob D.
Its a big mower, but happily it's still workable for our small section. There's no need for petrol mowers any more. Gone are the days of noisy, smoky, problematic, hard to start engines or trips to the petrol station, servicing, or oil changes. The engineering is good but not 100% sorted. I want to use it on the lowest height setting, but it becomes hard to push. A rubber flap which trails under the catcher seems an odd feature, no doubt to increase safety , but makes reversing difficult at the lowest height setting. 01 Nov 2018, Darren P.
Easily cuts both our back and front lawns plus the roadside verge. Easy to use. 29 Oct 2018, Rhys A. No car trips. No petrol. Is Quiet. Starts up immediately. You can store the lawnmower upright. No air filter, spark plugs or oil tank. I like that it has a sensor to increase or decrease revs pending on how much grass there is. Can give a decent 30min use if done regularly otherwise tall grass tends to use more power. Takes 30mins to charge battery with a rapid charger. Grass clogs up underneath when the grass is wet. Stopping the lawnmower completely can release the grass clumps. Sometimes the handle has to be fully extended otherwise it will not start. "Excellent especially when paired with the weedeater in the same series"
27 Oct 2018, Christopher F.
Easily does our 600+ square metres lawns on one charge. The powered version might suit some people with sloping lawns. 27 Oct 2018, Mary P.
Like mulching or catcher, very easy to start, height ajustment easy to use, all in all a good mower. Wish handle could go lower. hard to manoeuvre for short people. "Reliable electric alternative to burning two-stroke"
27 Oct 2018, Roland S.
Avoiding the noise and pollution of a fossil-fuel powered mower is a big plus for me. The battery delivers good power and does last about 45 minutes as claimed. It recharges quickly too. Starting is a breeze (essentially push a button and squeeze the throttle bar) compared with petrol mowers as it restarting if you stall it. The cut is even, the power responsive and it handles uneven ground very well. You can choose catcher or mulch as as well as a range of cutting heights; by working methodically you can handle very long grass. The handles fold up easily and neatly and are very sturdy. As others have mentioned it tends to clog up with damp grass (or just very long grass - over 15-20cm) For me, turning it over and having a wipe around under the tray is not biggie as it is comparatively easy to turn over and easy to start and stop. The battery charger is a bit noisy for the first 30 minutes or so as it does an initial fast charge and uses a fan to dissipate heat. This is nothing compared with the noise of a two-stroke though! You can get close to the edge of a lawn at the side of the mower but less so with the nose. "Switched to Ego cordless two years ago and love it"
27 Oct 2018, Tom M.
Always good to go, pop in the battery and start to mow. Almost no maintainance , check and sharpen blade once a year. Changing cut heights is very simple and easy. Needs frequent clean of underbody if grass damp, recommend cutting after morning dew has dried off! "Generally good but tends to clog"
Long run time, easy to use, powerful. Owned for 2 years no problems with reliability. Works well only on bone dry grass. Constantly clogs up if the grass is even slightly damp including dry but fresh green growing grass. Clogging happens even if the rear mower door is held open. "Not for a smaller garden"
02 Jun 2018, Dorothee C.
I have been using this mower now for 6 months and am not happy. I have a smaller garden and found that you can not mow close to a wall and have to push the long nose into your flower beds to get to the edge of the lawn if you can not approach it from another angle. I have not used the catcher because it would make the mower too long to turn small corners. Pity you cannot test drive before you buy to find these things out. Easy to start and mow and clean and store etc. Too large (long) for a smaller garden. I’d happily swap it for a smaller one that I can test drive first. I have only used it as a mulching mower. Not tried the catcher yet and unlikely to do so as the mulching is so good. Doesn't leave obvious tracking with trails of cut grass. Clean to operate. Battery very easy to remove and fit and gives at least 45 mins use on a charge. Good even cut. Very easy to fold up and store. Very easy to push on all but the lowest setting. Low noise and so easy to start. Makes a nice job of cutting, looks good when finished. Battery lasts well as long as you dont let the lawn get too long. Nice and wide and not too heavy. Quiet as an electric mower should be. "Mostly Good (after 1 years use)"
Easy to use, and well constructed. Good battery capacity lasts the whole lawn no problem provided its not too long or too wet. Power is good for normal mowing, but struggles on longer grass. This mower has a an annoying tendency to gradually clog the cutting deck even on dry grass. (Clogs very quickly on damp/wet grass). I don't use the catcher and prop the exit door up with a short bungy cord, but still the deck clogs. After each use I have to roll the mower on its side and clean out the deck. The blade has only a very small turn-up on each end to create a draft to push clippings out, presumably to save battery power. This means the wind draft created inside the deck is pretty minimal hence the clogging. I'm tempted to try a blade with a bigger turn up. 23 May 2017, scott w.
Best lawnmower I have had! Use to use and charge has never let me down. Only downside is its hard to get right to corner of lawns if they grow up to your house. Long run time on routine dry cutting. Mows well, mulches well. Great for most domestic sized lawns. Long nose is problem in confined spaces. On heavy cutting and mulching the battery time is cut by half or more. Poor on wet grass.. the body clogs up quickly. 01 Feb 2017, Ngaire M.
I like the battery , has a good mowing time and very easy to use. I find it doesnt do edges well and am dissappointed as my other mower did them really well. The nose on the mower is very long and in front of the mowing cutting part on the machine .